By admin | May 6, 2015. Dublin’s publicans are refuting claims of a rebound from the recession. In the bustling bars on Thomas Street, tourists mingle with regulars as they enjoy a pint and place bets on horse racing. Bar workers say that conditions have improved considerably compared to the same period two years ago. One barman said his proximity to the Guinness brewery was key to his success. Value lagers offer an alternative to customers, who stand to save at least one euro per pint compared to mass market beers. They have become particularly popular since the ‘credit crunch’ of recent years. But some city centre bars’ prices can still undercut pub prices by more than half. Discounts and promotions have become essential for pubs to survive. City centre superclubs pose competition to the city’s traditional pubs. 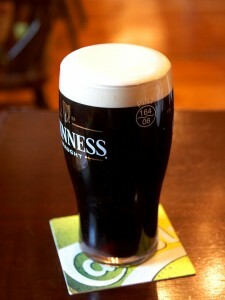 In a straw poll one evening, the average price for a pint of Guinness was €4.70. Value Added Tax and excise duty account for about a third of this price. On Harcourt Street, however, there was a promotional price of €2 during the week. With Wetherspoon’s on its way to nearby Camden Street, competition will only increase. Chain pubs famously cut costs by curbing entertainment like music and sports. Staff at more traditional bars are undaunted by the idea. ‘Those places are a bit soulless’, said one barman; ‘When you go to a pub, the atmosphere is what you’re paying for’. Another drew parallels with socialising in a library, saying that ‘Irish people prefer to feel more at home’. Minimum pricing laws will soon apply to off licences, which allow cost conscious consumers to drink alcohol at home. The National Off Licence Association (NOffLA) recommended a minimum cost of 70c per 10g of alcohol, which is approximately one standard unit. The actual price is expected to be between 90c and €1.10 if the Public Health Bill is passed during the summer. The government hopes the move will curb careless consumption of alcohol. Minister Leo Varadkar has said that only the cheapest alcoholic drinks will be affected. The Licensed Vintners’ Association (LVA) supports the move, saying it will create a level playing field for its 600 members around Dublin. It has been critical of below cost selling.